Thousands of people each year come to downtown Chandler, Arizona's Dr. A.J. 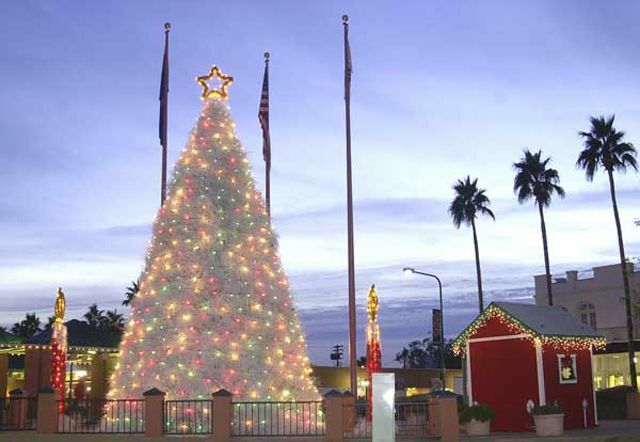 Chandler Park for the annual Chandler Parade of Lights and the Tumbleweed Tree Lighting, which takes place in 2018 on Saturday, December 1 from 4:30 to 9 p.m.
As the name suggests, the event features a full parade and the lighting of one of the most unique Christmas trees in the United States accompanied by holiday music and dance by local performers throughout the evening; visitors will also get a chance to visit Santa's House to sit on Santa's lap and enjoy some local-made foods at one of the many vendors on-site. Admission to the Chandler Parade of Lights and Tumbleweed Tree Lighting events is free, but there may be a charge for some activities. There is free parking around downtown Chandler, including the municipal garages and lots, library parking lot and Chandler High School. Leave extra time because several intersections will be closed for this event and the parade. Disabled Parking (placard or plate required) is between Boston Street and San Marcos Place on the west side of Arizona Avenue (enter from Boston via Frye Road to California Street and then to Boston). In 1957, Chandler resident Earl Barnum raised the idea of a tumbleweed tree after he saw a similar one in Indiana built out of cone-shaped chicken wire with pine boughs stuck in the holes. Members of the community helped create the first tree in Chandler using tumbleweeds that they gathered from around town. Since then, this annual tradition has blossomed into a must-see attraction for Christmastime visitors to Arizona, featuring some of the best talent and most dazzling displays of lights in the region, and the parade started just a few years after the first tumbleweed tree was constructed and has since grown into a city-wide event. However, since the event takes place early in December, you'll want to also check out our comprehensive guide to Christmas Holidays in the Greater Phoenix Area if you plan on visiting the state this time of year as there are plenty of activities to keep you in the holiday spirit throughout the rest of the month. While some features change from year to year, visitors to Chandler can always expect to find local businesses, dance troupes, performances, and artists on display during the Parade of Lights, with performers taking to the main stage between 4:30 and 8:15 p.m. Visitors can also stop by Santa's House during the concert (the house will be closed during the parade) where they can get a picture with Santa, create handmade ornaments in Santa's workshop, or even write and send a letter to the main Santa Claus at the North Pole. The Parade of Lights begins at 6:45 p.m. and features more than 50 entries, including floats, dancers, and local businesses, and immediately following the parade will be the lighting of the Tumbleweed Tree. The parade route will start at the corner of Arizona Avenue and Frye Road and will move north on Arizona Avenue, past Chandler City Hall and continue through the downtown area. As it reaches the north end of Dr. A.J. Chandler Park, the procession will turn right on Buffalo Street, followed by another right turn onto Arizona Place. After moving along the east side of Dr. A.J. Chandler Park, the parade will end at the corner of Boston Street and Arizona Place. For more information on acts performing at this year's event, visit the Chandler Parade of Lights online.